SOSHI Educational Group continues its pursuit of innovation in school education. Over the last 50 years, we have been the frontrunner of private education, ranging from pre-school to tertiary levels, providing distinctive educational services. Private after-school tutoring service ‘Learning Circle’ was founded (renamed Sozo Gakuen EDIC in 1989). 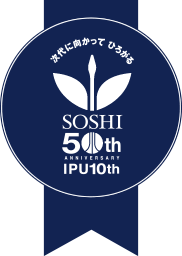 The starting point of the SOSHI Educational Group was a tutoring service, which was started by the founder Hiroshi Ohashi at the request of four children in his neighbourhood. Fifteen years later, the school had grown dramatically and was teaching 5,500 students in 10 locations. Education Research Foundation was established. In order to satisfy wider public demand, Ohashi started establishing various educational foundations. Bunkyo Seminar university entrance preparatory school was established (renamed 'Sogaku Seminar' in 1997). Kokusai Jiyu Gakuen upper secondary specialised school was established. Kokusai Jiyu Gakuen Tokyo Campus opened. IPC Tertiary Institute (International Pacific College) opened (renamed IPU New Zealand in 2015). In 1987, academic leaders and educational experts, including Ohashi, gathered in Honolulu, Hawaii to discuss the concept of a tertiary educational system with a consortium of campuses in Pacific-Rim nations. The outcome was a plan to establish New Zealand’s first private tertiary international institute with boarding facilities. In 1990, IPC Tertiary Institute (International Pacific College, renamed IPU New Zealand in 2015) was established in Palmerston North. IPU New Zealand now has students from more than 25 countries, including non-native speakers of English, and is successfully helping them to achieve their goals at undergraduate and postgraduate levels. Clark Memorial International High School opened. Making use of a nationwide upper-secondary correspondence learning system, Clark High School now has 64 locations in Japan and overseas, where more than 11,000 students are learning. (renamed IPU Women’s College in 2012). Foundation for Promoting Children’s Education was established. The group established a public interest foundation accredited by the Ministry of Education, Culture, Sports, Science and Technology, Japan – the first in the group’s history. Nihon College of Health and Medical Science opened. Kansai College of Health and Medical Science opened. The group established two medical specialist colleges in order to develop practitioners with the ability to heal body and mind. Tokyo International Business College opened. TIBC offers a forum where students from various parts of the world can deepen their international connections while striving to achieve their goals. Fukuoka International Business College opened (renamed Tokyo International Business College Fukuoka Campus in 2012). The first university of the group started in Okayama, Japan. With ‘excellence in academic and sporting pursuits’ as the institutional core value, IPU develops educational specialists, top athletes and international students. Genki-no-izumi Social Welfare Corporation was established. This establishment enabled a daycare centre, a kindergarten, and a junior college to be established in the same campus, which was unique in western Japan. Okayama Medical Welfare School joined the group. Kobe International Business College opened. Soshi Gakuen High School opened. The new addition enabled the group to offer upper secondary education in a more comprehensive manner. Tokyo International Business College Kobe Campus opened. Waseda International Business College opened. Musashino College of Arts opened. Tokyo Management College joined the group. As a college that prepares students for their career paths after two years of study, Tokyo Management College develops work-ready individuals who are skilled and qualified to meet the needs of local communities. Since the establishment of a tutoring school with four children in 1966, SOSHI Educational Group has continued to address current and future challenges in education and develop individuals ready for the future, defining ‘Education as a Creative Challenge’.